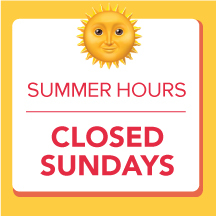 Starting June 3rd, We'll be CLOSED on Sundays, and OPEN Mondays. PRIVATE PARTIES CAN STILL BE BOOKED, (minimum painters required). Look on our homepage for our new summer hours!